“We’ve taken a major step back in time, beyond what we’d ever expected to be able to do with Hubble. We see GN-z11 at a time when the universe was only three percent of its current age,” explained principal investigator Pascal Oesch of Yale University. The team includes scientists from Yale University, the Space Telescope Science Institute (STScI), and the University of California. , is seen as it was 13.4 billion years in the past, just 400 million years after the Big Bang. GN-z11 is located in the direction of the constellation of Ursa Major. Hubble spectroscopically confirms farthest galaxy to date. These findings provide a tantalizing preview of the observations that the James Webb Space Telescope will perform after it is launched into space in 2018. “Hubble and Spitzer are already reaching into Webb territory,” Oesch said. 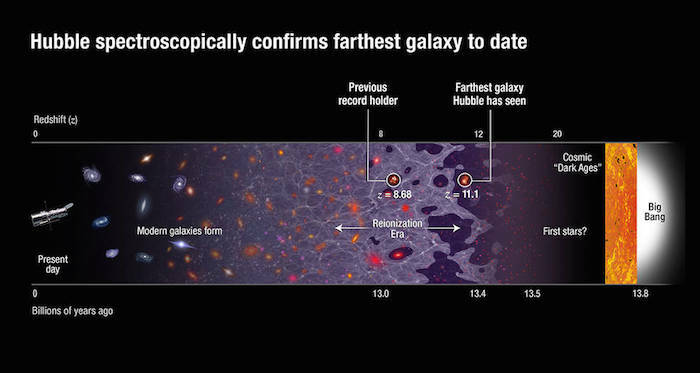 “This new discovery shows that the Webb telescope will surely find many such young galaxies reaching back to when the first galaxies were forming,” added Illingworth.